Join us for the release of Bourbon Little Brother, our Heaven Hill Bourbon aged Belgian Dark Strong. We’ll have 750ml bottles for sale for $11 and $125 per case. 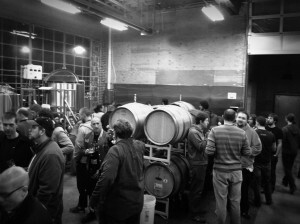 To celebrate we are hosting a potluck & bottle share in our brewery. Just show up with a bottle of beer and/or food to share with friends. Come help us celebrate our first year as The Commons Brewery. We’ll be tapping a few special kegs, including the last bit of Plum Bretta, Gin Barrel Bruin and 2011 Sticke. We’ll have appetizers provided by Lardo, Pacific Pie, 2nd Story and Cheese Bar. Special toast at 7pm. Facebook Event Page. We really hope you can make it and celebrate with us.